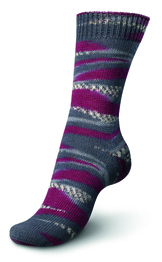 Regia 2896, Riverdale, is from the Regia City Streets 4 ply sock knitting yarn range. 100g/ 420m per ball. Regia sock yarns have a supersoft, machine washable and hardwearing blend of 75% wool and 25% nylon. 50g/ 210m per ball and 100g will make a pair of adult socks.